Tonight, try star-hopping to the famous Andromeda galaxy – the large spiral galaxy next-door to our Milky Way – from the Great Square of Pegasus. The planet Jupiter will be your guide. Ready? First, look westward for the four stars of the Great Square. You will find them to the right or upper right of the blazing planet Jupiter – in the west at nightfall and early evening. Keep in mind that our sky chart covers a larger portion of sky than it usually does. The Great Square is so large that your hand can slip in between any two Great Square stars. Hold your hand at arm’s length whenever measuring distances on the sky’s dome. Focus on the top star of the Great Square. If you look carefully, you will see the constellation Andromeda as two streamers of stars jutting up from this uppermost Great Square star. To me, the two streamers make the shape of a cornucopia or a bugle. Go to the second star upward on each streamer: Mirach and Mu Andromedae (abbreviated as Mu on the sky chart). Draw an imaginary line from Mirach through Mu, going twice the Mirach/Mu distance. You have just landed on the Andromeda galaxy! On a dark night, the Andromeda galaxy looks like a faint, blurry patch of light. If you cannot see it with the unaided eye, your sky might not be dark enough. Try binoculars. So, try it tonight. 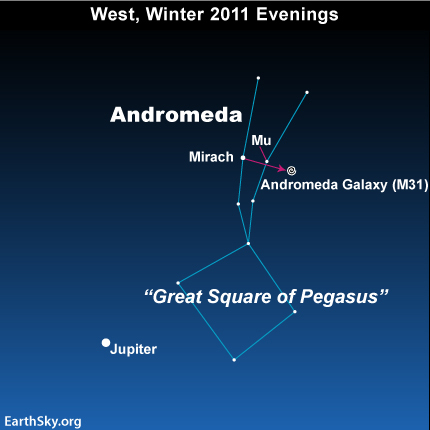 Star-hop from the Great Square of Pegasus to the Andromeda galaxy! Site contents copyright © 2019 Recorder Online	except as noted. All rights reserved. | 88 queries in 2.230 seconds.